A wet and miserable morning greeted us when we awoke, dashing any hopes of brighter weather for our last day at Vișeu de Sus. 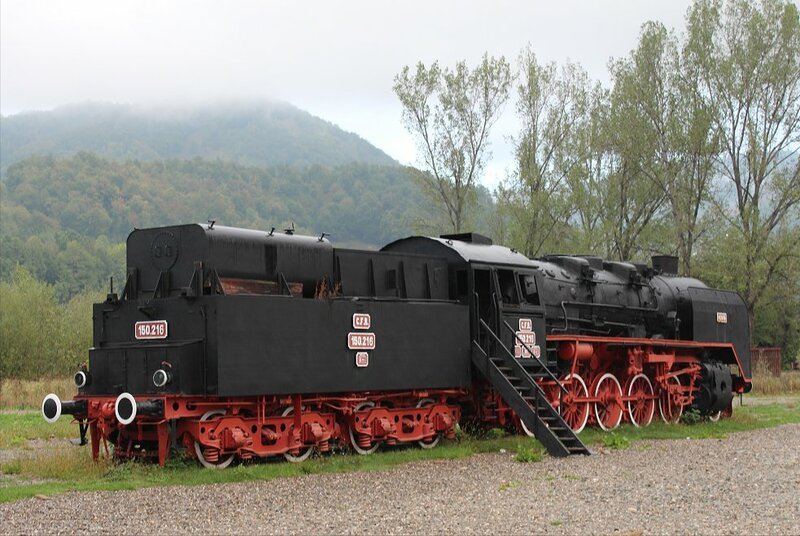 Nevertheless, a new day with a new loco (the 0-8-0T 764-211 named “Mariuta” minus her nameplate for the day). 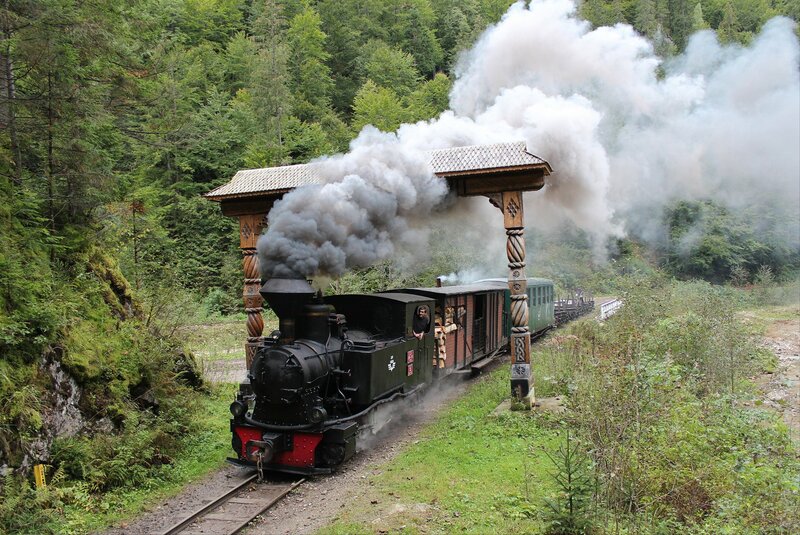 Although new is probably the last word that should be attached to such a venerable locomotive, now over 100 years (she was built by Orenstein & Koppel in 1910). 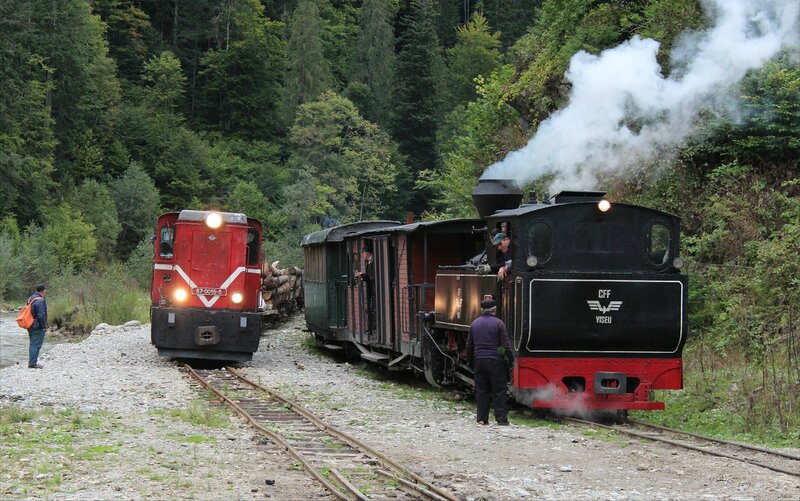 A drab stop at Valea Scradei turned into an inspired choice when someone suggested a posed shot of the locals with some props as the steam locomotive charged up the line. Our brakeman demonstrated a hidden talent for comedy as he posed with a bottle of tuică that no-one could resist smiling at, in spite of the conditions. I quite liked a shot across a field a little farther up the line which captured some of the charm of the valley. 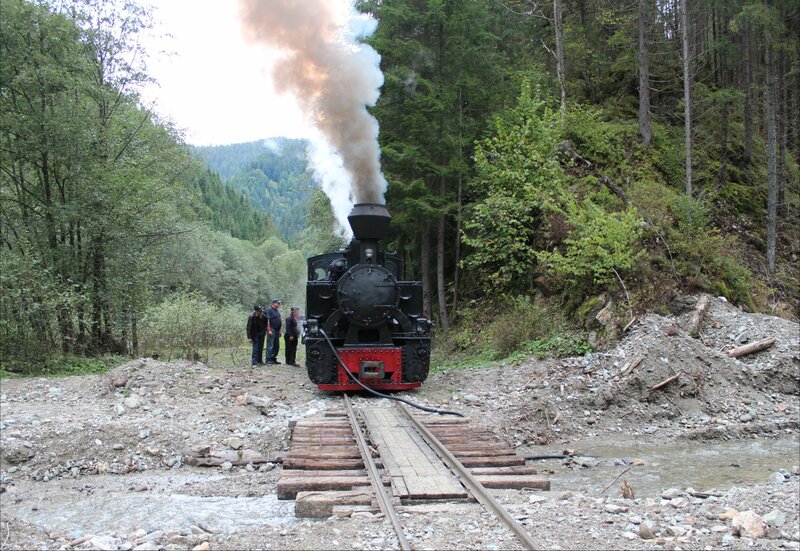 Other stops saw us taking in the delights of bridges, rocky outcrops and a saw mill with the occasional pause to let more of those wonderful homemade railcars pass. 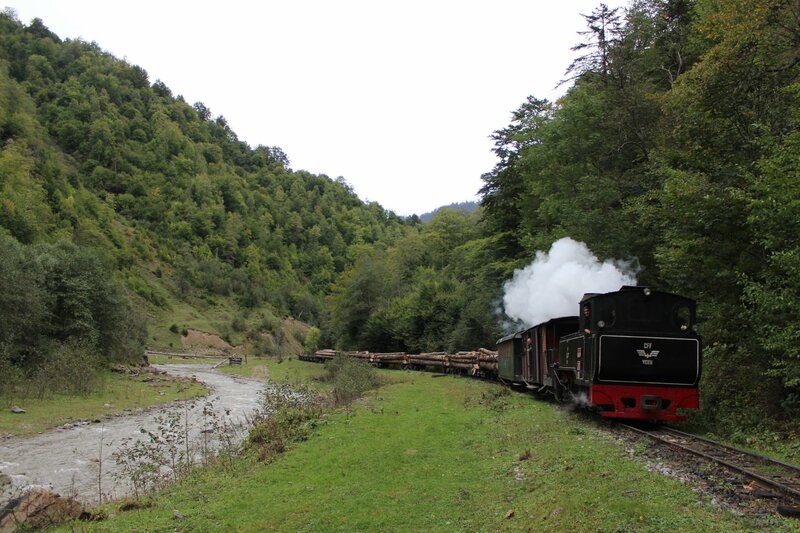 We reached Paltin just after 1pm and took our lunch stop there before returning back down the line in the afternoon. It’s hard to know what the future will hold for this line. 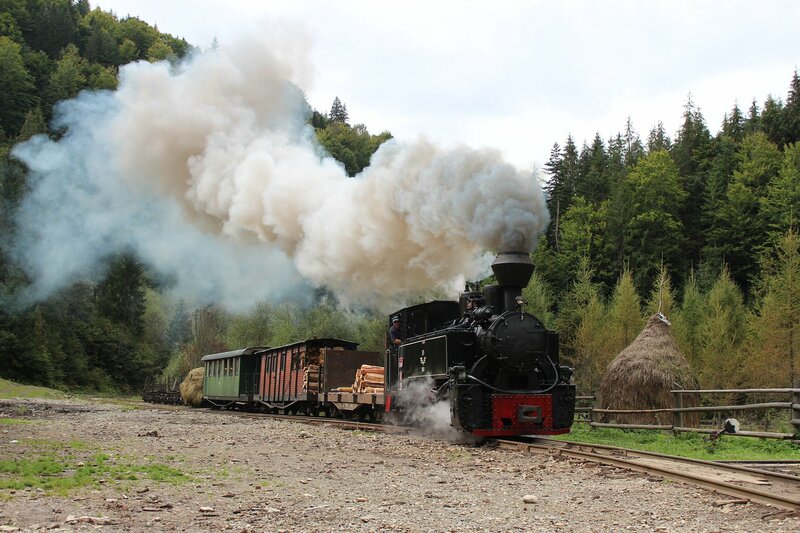 It is an amazing survivor, given how many other forestry railways have fallen by the wayside, but it still faces many challenges in the yeats ahead. 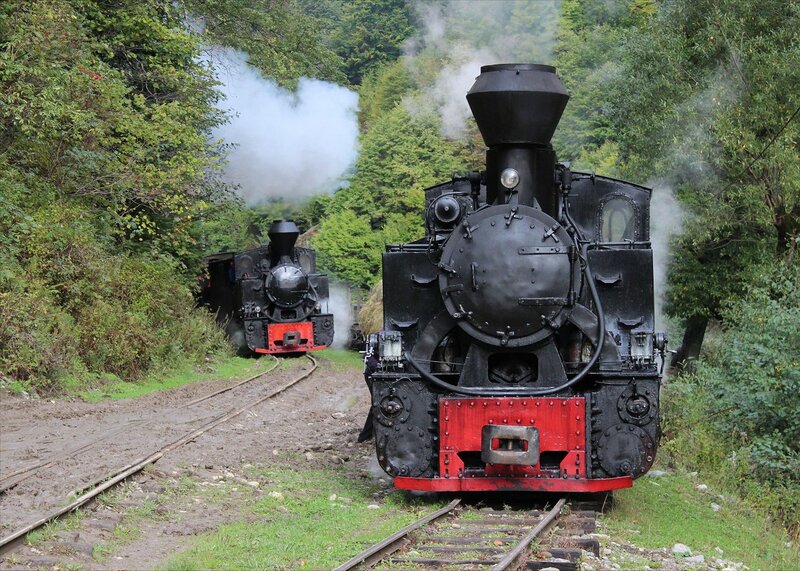 The line is currently operated by a private Romanian company, but the infrastructure and forest still belong to the state. 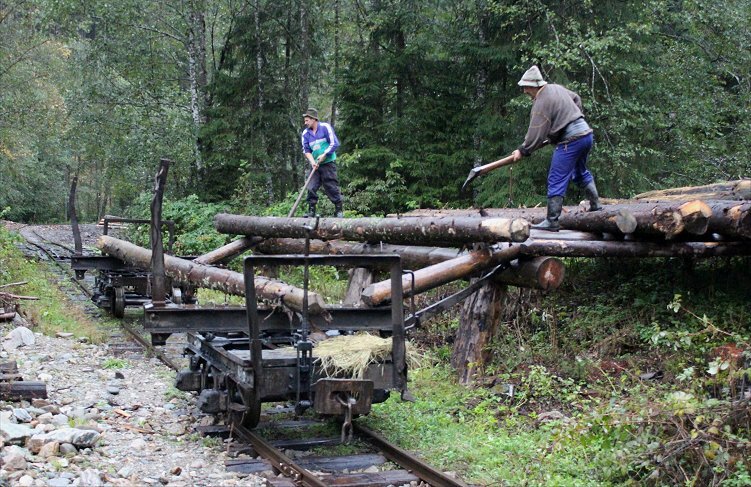 According to some accounts the quality of the wood coming out of here is pretty poor and even this production is being challenged by new operations that are not reliant on the rail system. Even today we had seen loggers from with hefty tractors dragging logs from one side of the river to the road-connected side of the river. There’s no doubting the appeal that the valley holds for tourists and photographers, but is that enough? 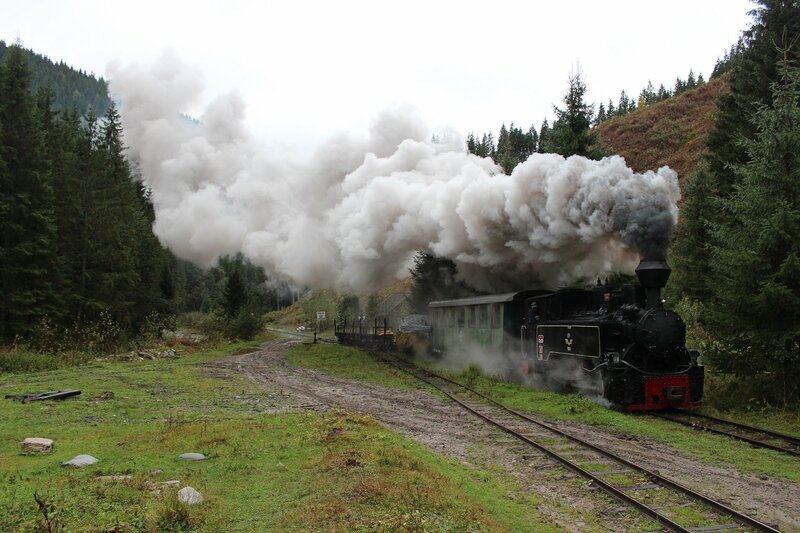 I’m not sure I would come back again, at the risk of another wet week but then again I said I would only visit China once and ended up making four trips to see real steam there! Nevertheless, I take my hat off to the tormented souls that have been back time and time again with only a handful of sunny days to show for it. When it is good, it is clearly very good… quite a lure. 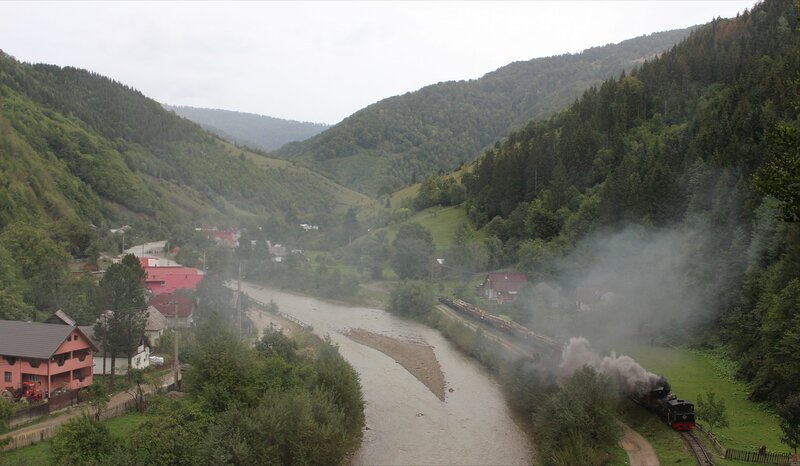 Our day on the line finished with our arrival back in Vișeu de Sus at 4pm with what we understood to be a three and a half hour drive between us and our pensions in Moldoviţa in Suceava County. 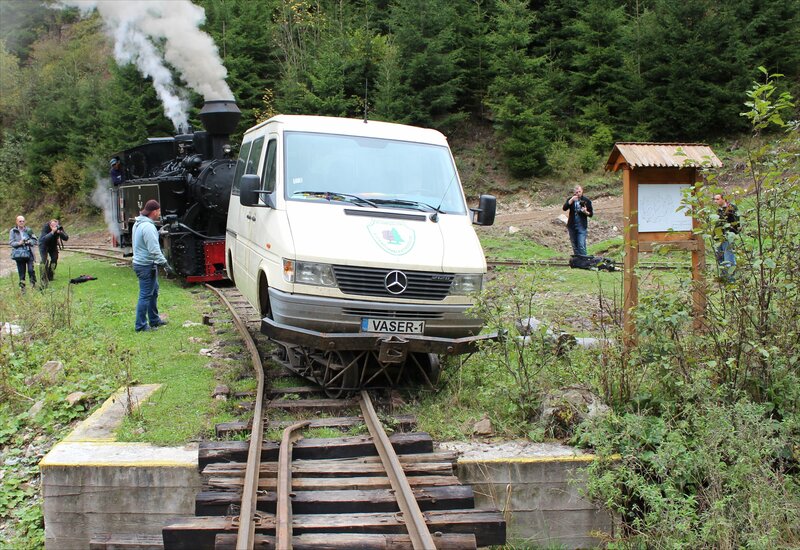 In fact, our journey didn’t take as long as that because our driver treated it as an open audition for Top Gear. 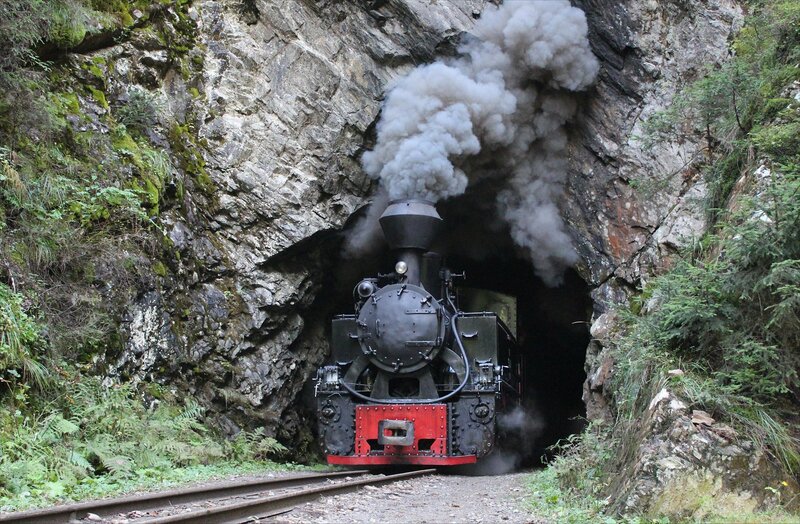 To achieve a shorter time involved driving through villages at way over the minimum speed (on one occasion topping 95km per hour where the speed limit was 45 km per hour) and some hair raising passes of logging trucks on the zig-zagging mountain roads. 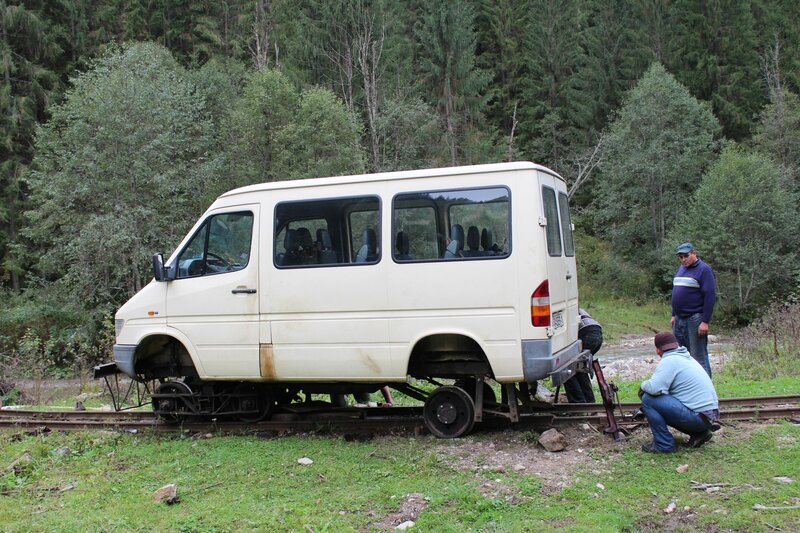 Our tour leader, Bernd, was spot on when he said that it was better to sleep and not see what was happening on the road! The direction to ‘follow the man with the chainsaw into the forest’ sounded like it should have belonged in a dodgy horror movie rather, but it’s not the maddest moment to have occurred in a railtour by a long stretch! 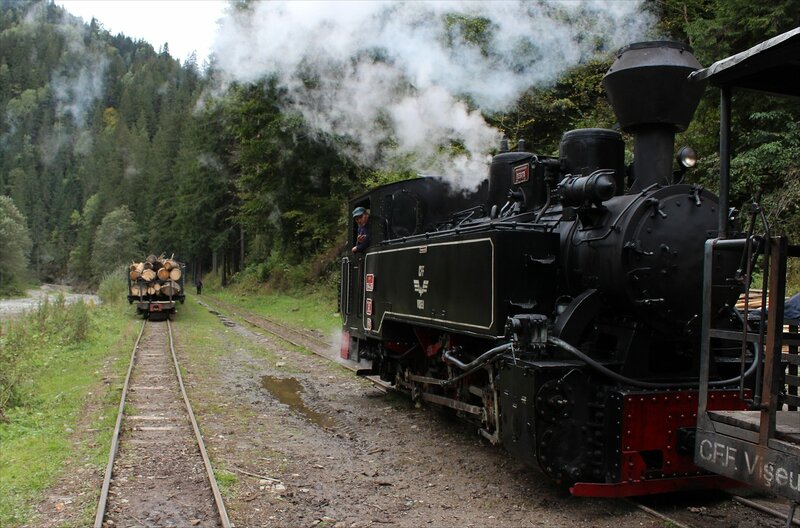 In fact, we were going to watch the traditional logging process, beginning with the felling of a tree in the forest and its rather perilous transportation down a steep slope to the lineside, dragged by a pair of horses. At the lineside we watch two forestry workers loading wagons from the loading platform which was more interesting than it probably sounds, involving some synchronised movements from the workers to lever the logs onto the ramp and roll them carefully into position (occasionally using axes to even out their passage). An impressive exercise in co-ordination but a skill that is inevitably disappearing. 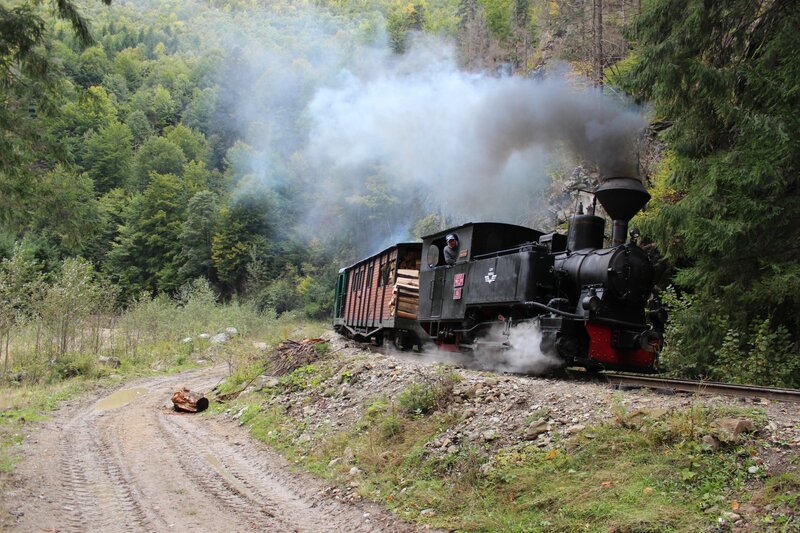 Yesterday’s journey had brought us most of the way towards the end of the line, but there was still a little further to go this morning so we left our freshly loaded wagon behind and set off for the terminus at Comanu at 9.25am. 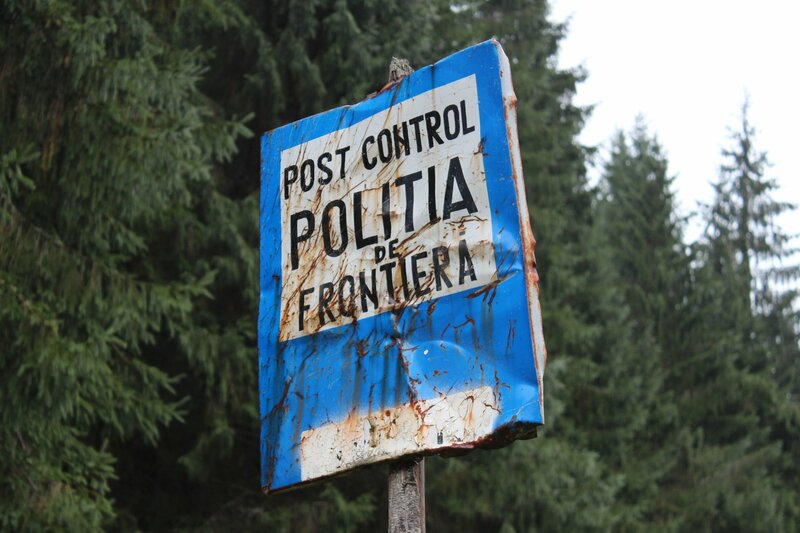 Our proximity to the Romanian-Ukrainian border was indicated by a rather battered sign for a Politia de Frontiera control post, although there didn’t seem to be any guards present (we had spotted one of their four wheelers a little earlier so they were around somewhere). 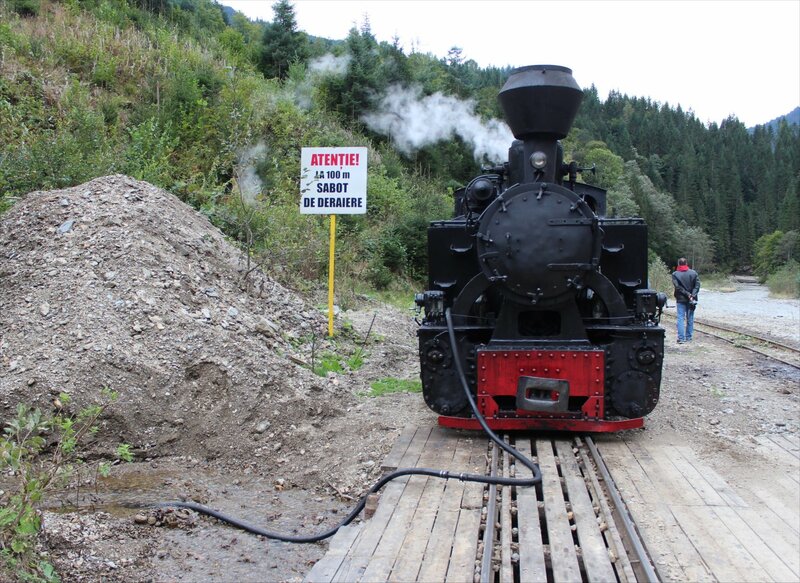 Our loco ran around and the brake man followed this by skillfully controlling the descent of the carriage and wagons back down to it, ready for our departure down the line. We set off at 10.50am and by 1pm we had made it to Botizu. 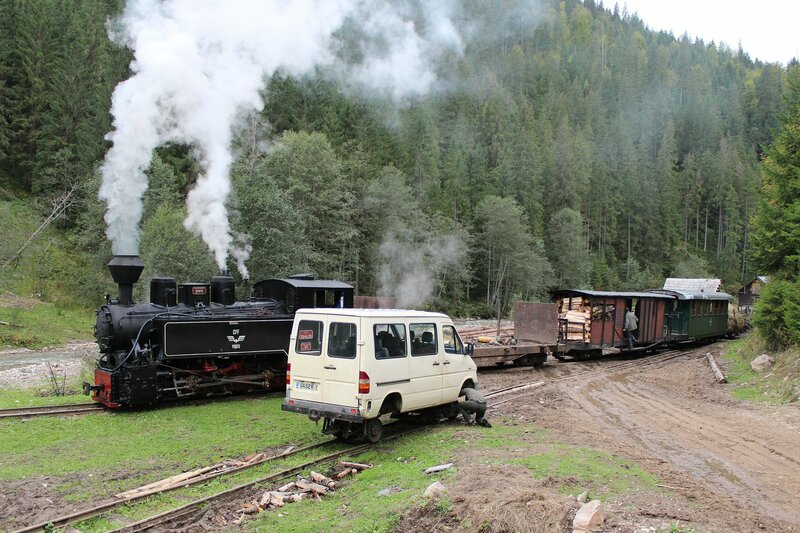 Here we dropped the empty logging wagons, replacing them with six loaded wagons. This change turned our charter into a revenue earning production service so the opportunities to photograph this would be limited. 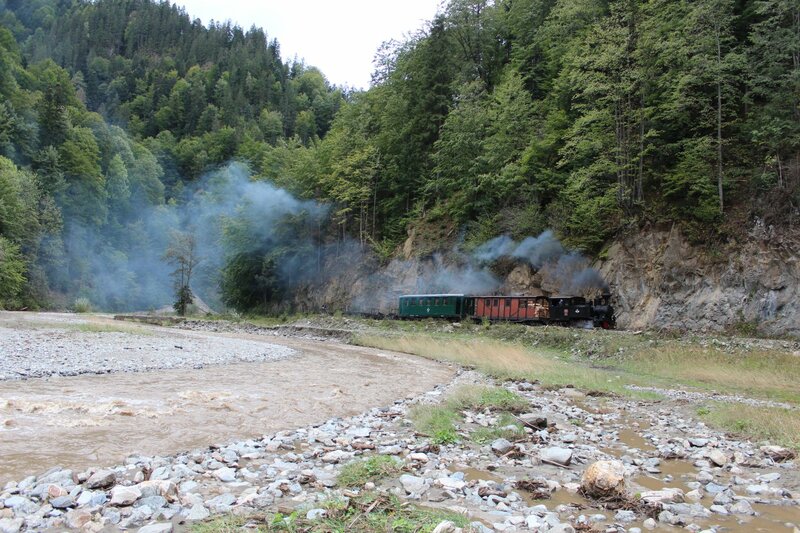 On the way back to Vișeu de Sus we had the opportunity to see some more of the rail vehicles on the system, including a railcar (named the Rossiya 1) and a diesel hauled logging train (using a CFR class 87 diesel-hydraulic loco) which provided an interesting comparison between our train and an authentic logging train of the present day. 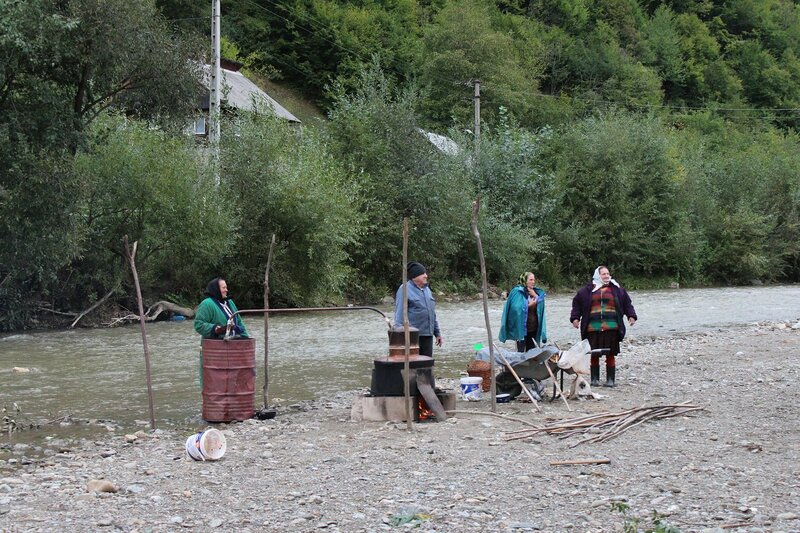 Other sights included a group of locals distilling on the waterfront using the murky waters of the Vaser (astonishing to think that this is the base for the very clear and potent liquer that is țuică). After returning to Vișeu de Sus we made our way to our pensions and the prospect of a lovely home cooked meal – a delicious vegetable soup, sarmale (cabbage rolls stuffed with minced meat and vegetables), apple strudel and țuică. A wonderful way to end a challenging day. 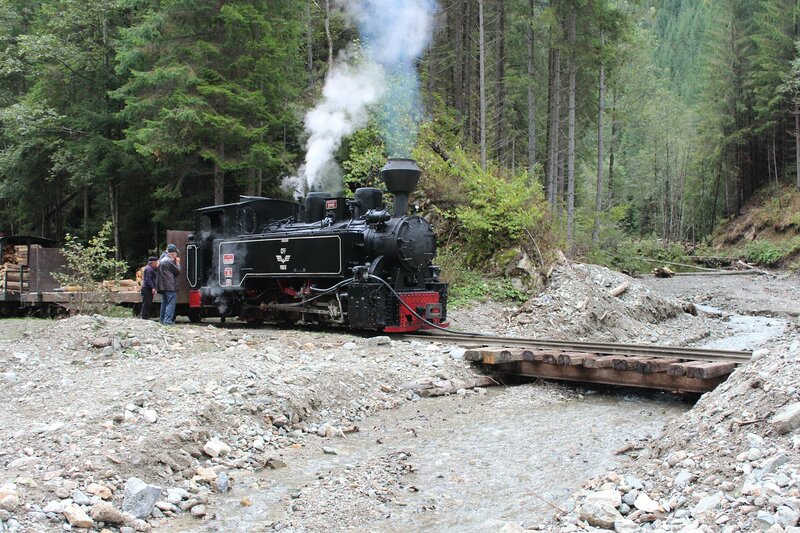 The derailment of the lone railcar had taken place just 1km up the line from Faina, just before a small bridge. 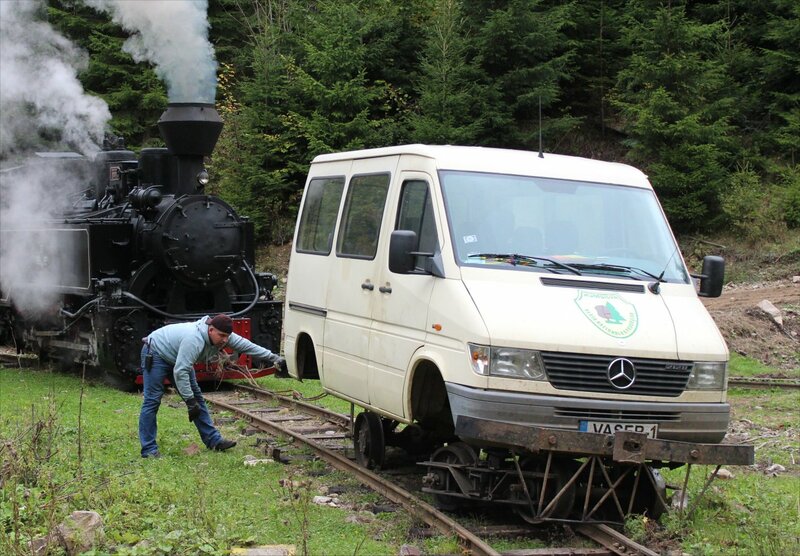 It had involved one of the more unusual vehicles on the line, a ranger’s draisine, which was essentially a road going minibus converted into a railcar. On the railway we had already seen a wide of variety of these home-built vehicles, ranging from Ford transits to VW camper vans, but this one was adapted from a Mercedes 2120. Thank goodness the derailment had not occurred a metre further on, at the bridge, or the results might have been rather more serious. 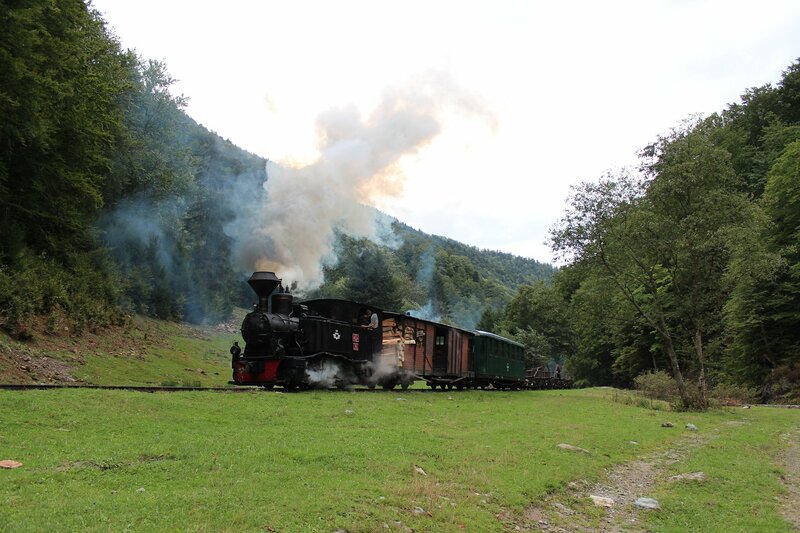 The first step was to pull the railcar back from the brink, which was simply achieved by our steam locomotive and a cable ‘tow rope’. 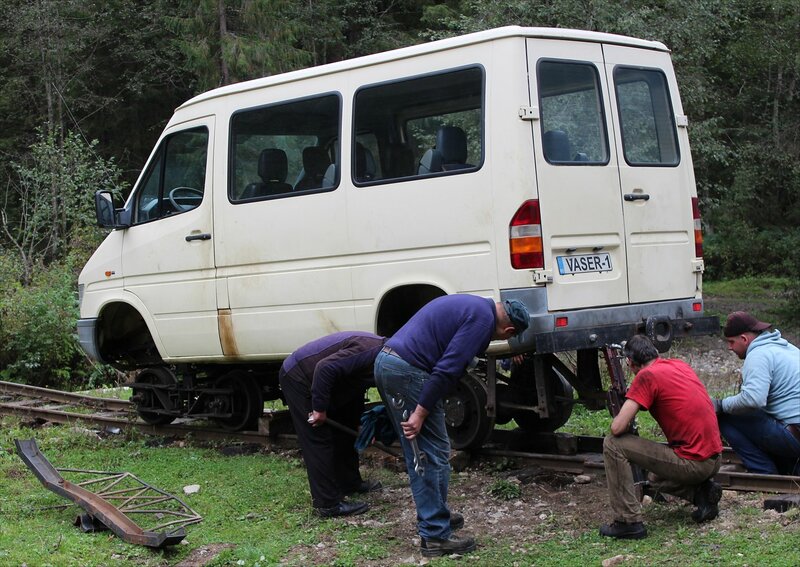 Next, the crew set about jacking the railcar up so that they could lift it back onto the rails, succeeding at the second attempt (impressively just over half an hour after our arrival). The broken rail that caused the derailment was easy to spot. 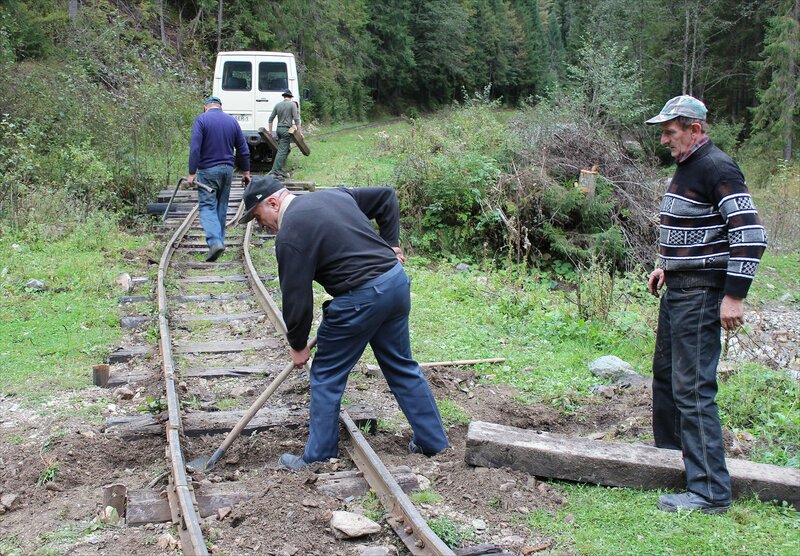 The crew set about tackling the track repairs next, including the replacement of the old sleeper. 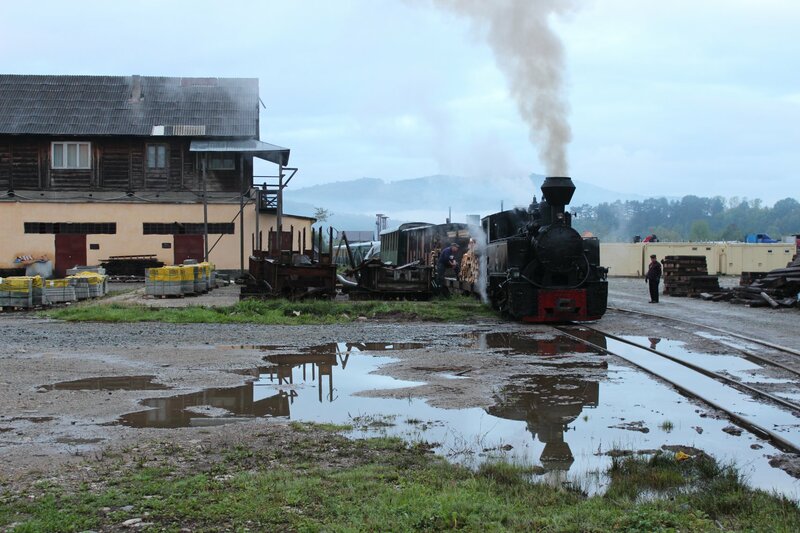 The repairs were completed and successfully tested at 4.50pm, exactly an hour after our arrival. The crew’s efforts were all the more impressive considering that they had the distraction of thirty photographers snapping away from every angle! 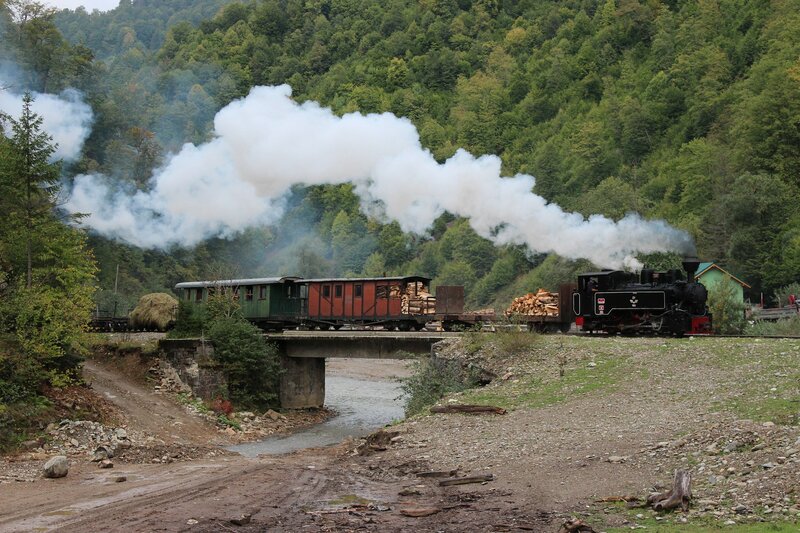 We followed our train over the bridge and re-boarded the ‘Valei Babei’ express for the last kilometres, arriving at 5.15pm. Our accommodation for the night was a school dormitory with some rather curious frescoes (Baza didactica “valea babi”) which turned out to be quite a bit more civilised than any of us expected (though the members of our parties with ground floor cabins might have taken a different view after finding chickens in their beds!). 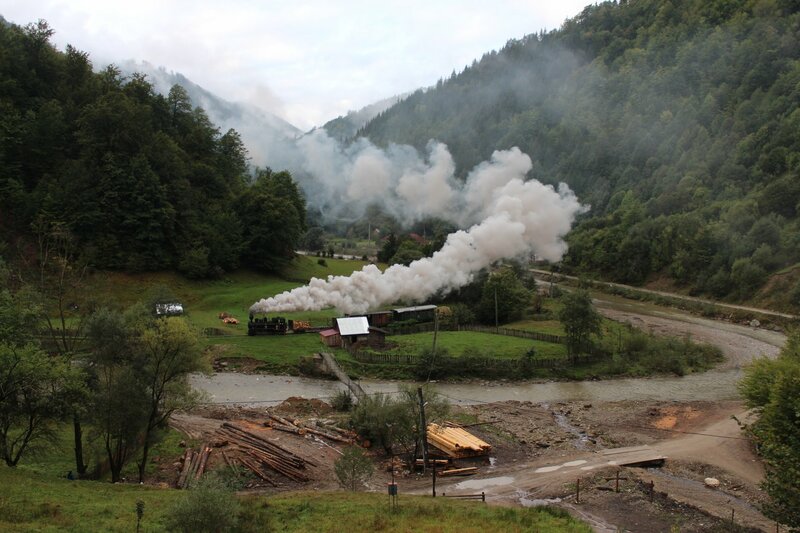 As rain began to fall we scurried over to the dining hall where we were served up a hearty meal of cheese porridge (mămăligă) with sausage, goulash and cherry sponge – washed down by beer, tuică and homemade blueberry liqueur. Fueled for the night, all that was left after this was a quick dash across the rain drenched grounds to the dormitory. Time to snuggle down under our donald duck duvets in time for lights out! 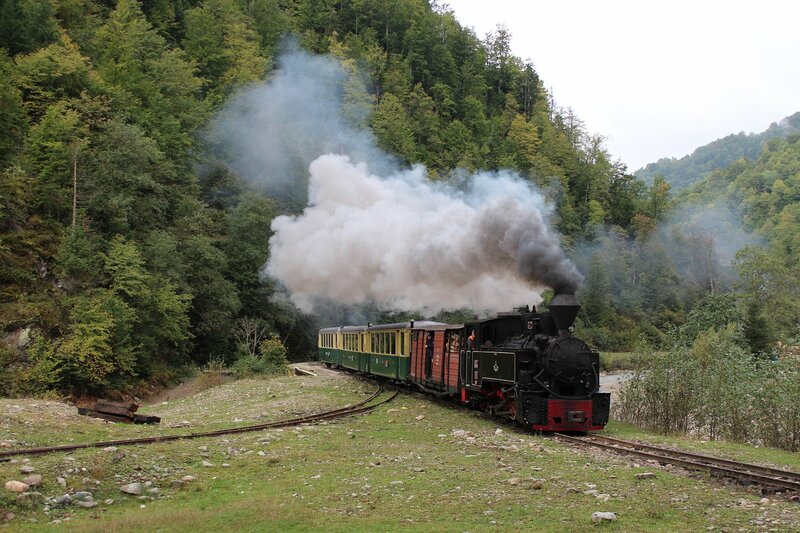 An early-ish start from Vișeu de Sus for our trip up the Vaser Valley in Maramureş County, travelling relatively light with just a few extras ahead of an overnight stay in a basic guesthouse at the other end of the line. 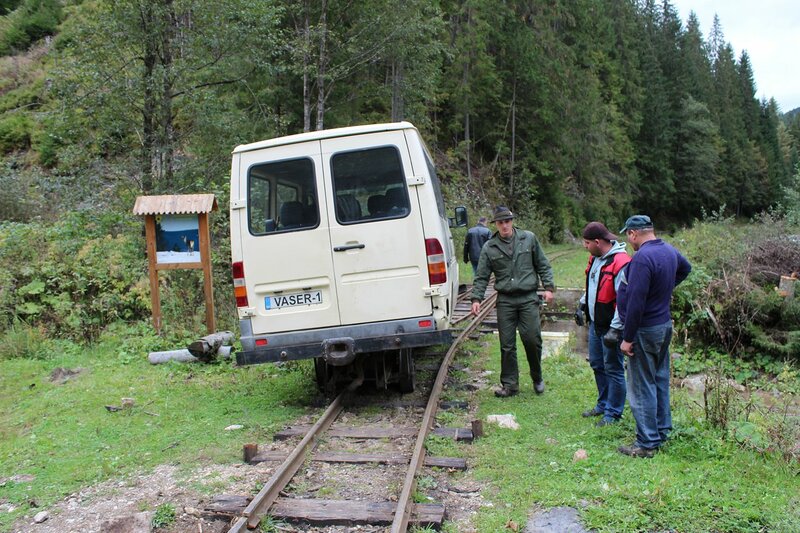 On top of this, we made sure to pack our passports just in case they were needed – the line takes us pretty close to the Ukrainian border and it is not unknown for border patrols to stop travellers in these parts. 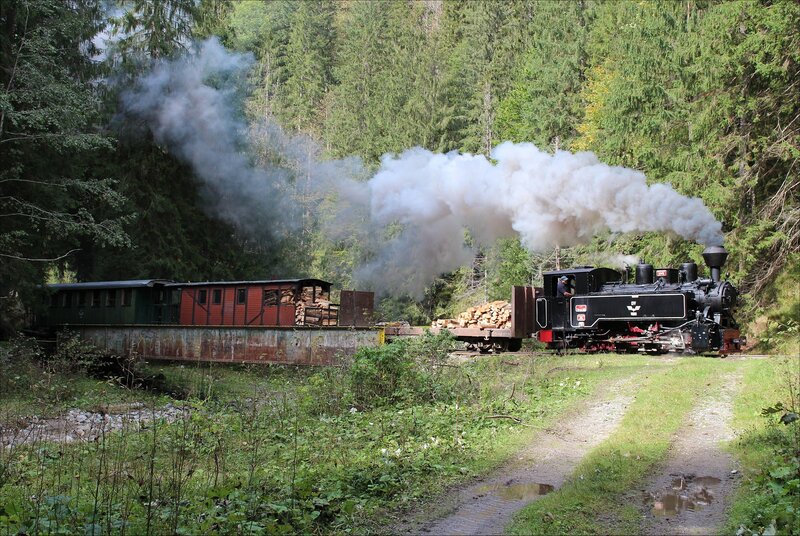 The plan was simply to head up into the Carpathian mountains, past the end of the line for tourist services at Paltin, then on to Faina and to our stop for the night at Valea Babei. 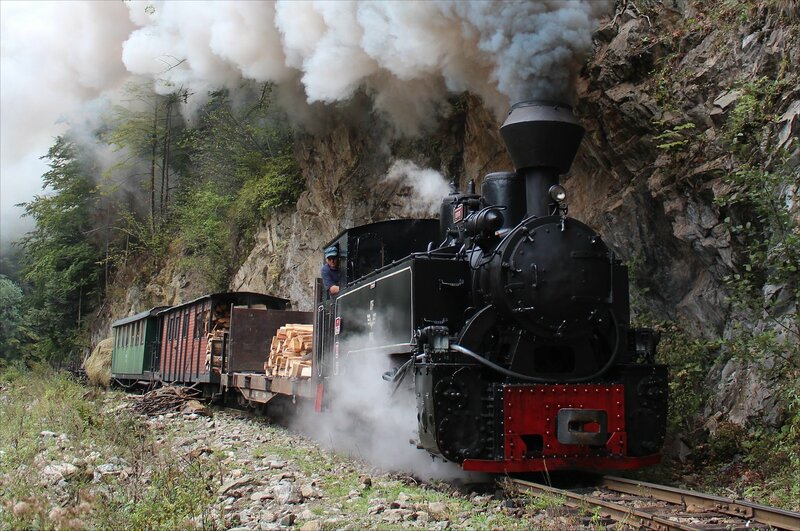 Our special train would be hauled by Resita locomotive 764-449 (manufactured in 1955) and consisted of a couple of passenger carriages, a special tender and some wagons. All very authentic. Starting early allowed us to make a few runpasts on the lower stretch of the line for a couple of hours before the tourists services got going. Although the weather was not at its kindest there was something rather atmospheric about the damp conditions in the valley. A stop at Valea Rea gave us the chance to stretch our legs, crossing a rather suspect suspension bridge over the river which tested our ability to dodge the slippery, rotten wood planks! 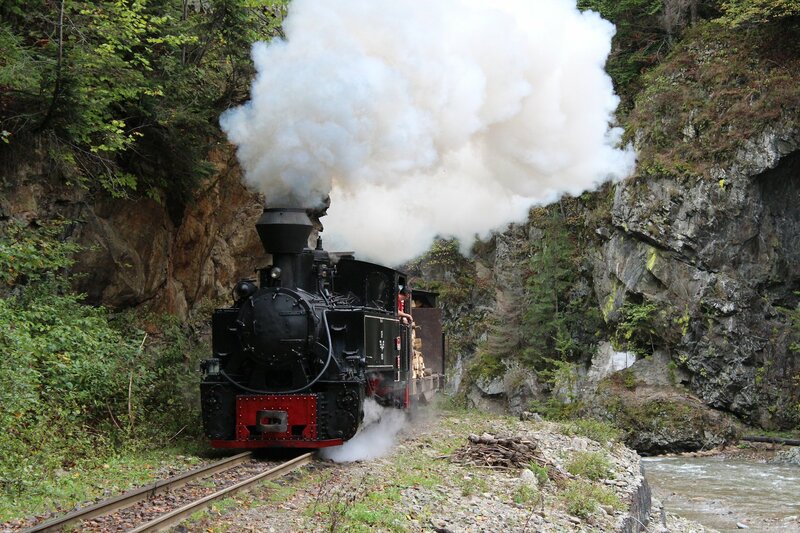 I’m sure we exceeded the recommended load as our party trooped over but somehow we all made it across and clambered up the hillside for a wonderful view of our train rounding the curve, the smoke lingering in the air for an age. A second runpast gave us the chance to repeat the process from the riverside, standing around in near liquid mud to get the shot (whilst also dodging a would-be rally driver who seemed hell bent on splashing our motley handful of photographers!). If we had any complaints about the conditions these were tempered by the knowledge that the weather overnight had been considerably worse – this place wouldn’t be much fun in heavy rain. 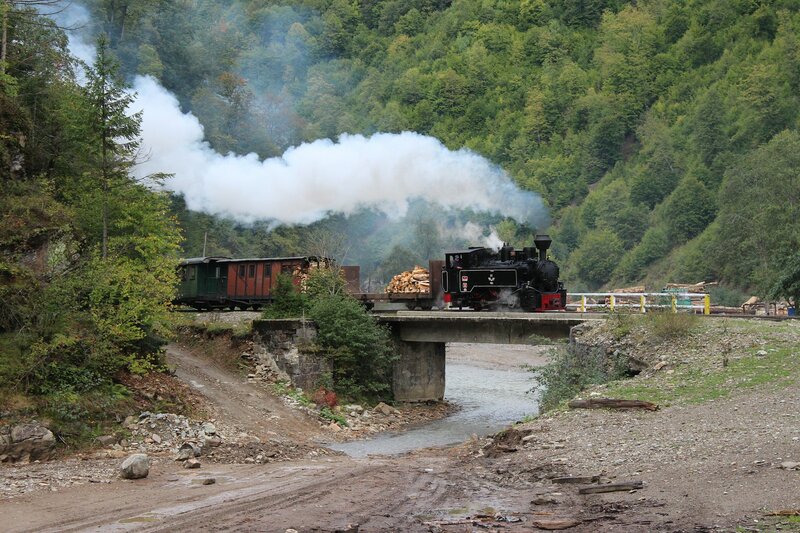 After returning to our train we carried on a little further to a passing point near Delta Novat where the two steam hauled tourist trains could leapfrog us (at 9.45am and 10.15am respectively). It was encouraging to see that both trains were packed full at such a relatively late date in the season. The shots on the line beyond this point included an opportunistic shot with a young shepherdess and her flock, at a water stop (where the loco took water from a pool of water from a mountain spring using a pump) and at a photogenic rocky outcrop. Along the way we saw plenty of the beautiful surroundings that make this line such an attraction, as well as the reconstruction work on the riverside that stands testament to the power of the ever present danger of flooding (large sections of the track were washed away in floods in 1982 and in 2008). I have to admit that it had been a surprisingly good morning with some almost respectable photographic results, even if we didn’t have beautifully illuminated forest in our shots! 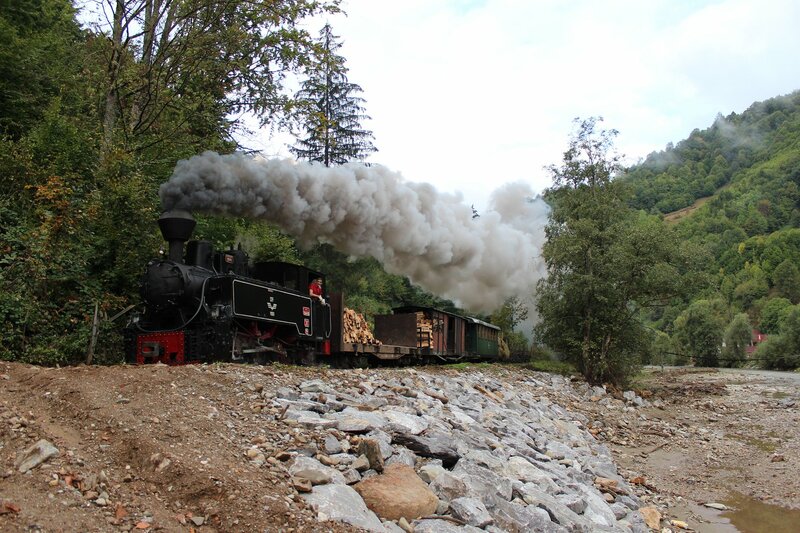 At the tourist village at Paltin, the limit of normal passenger services, we re-passed both of the trains from earlier in the morning (around 12.30-40pm) before progressing up the line towards Valea Babei. 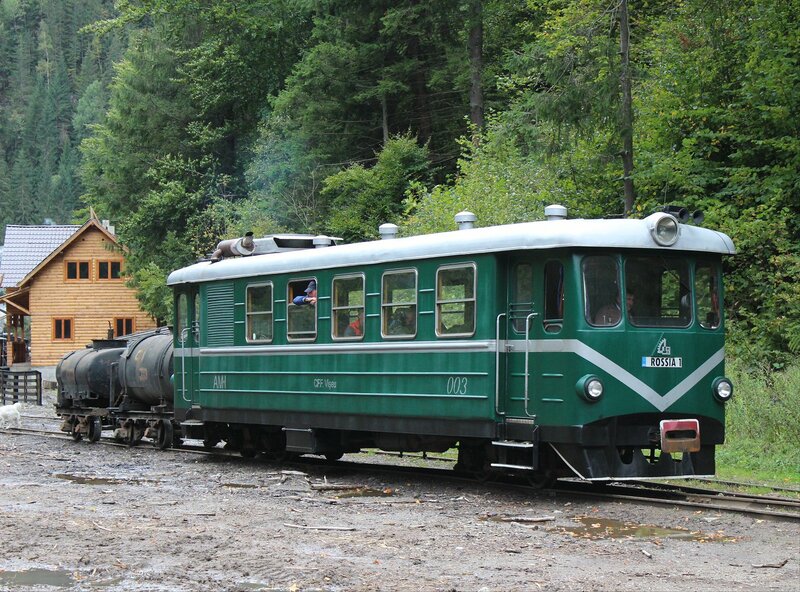 From this point we had the line to ourselves, barring for one railcar further up the line. 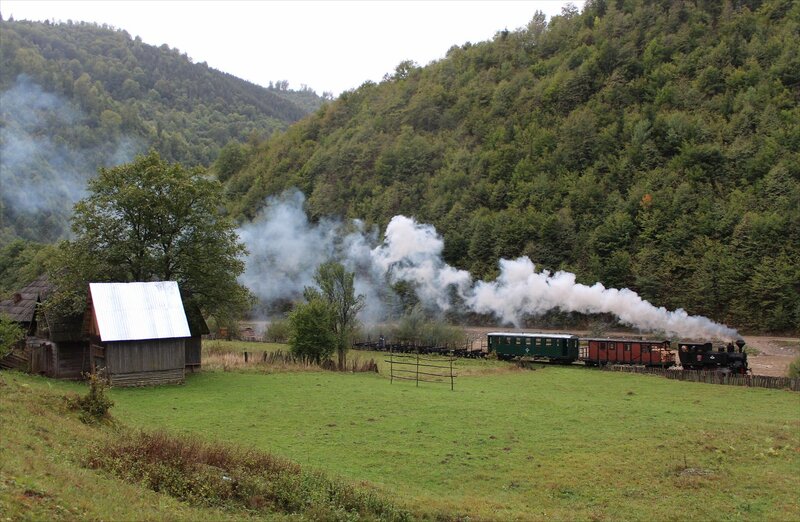 The scenery continued to deliver yet more photogenic sights, from traditional haystacks at Bardau to a tunnel and bridge at Botizu. The morning turned out to be as grey as predicted, though nowhere near as wet. A wander through town took me into the striking Orthodox Metropolitan Cathedral (1923-1933) and the austere Roman-Catholic Cathedral of St Michael (1390) before heading up to Cetăţuia Hill for a view across town. 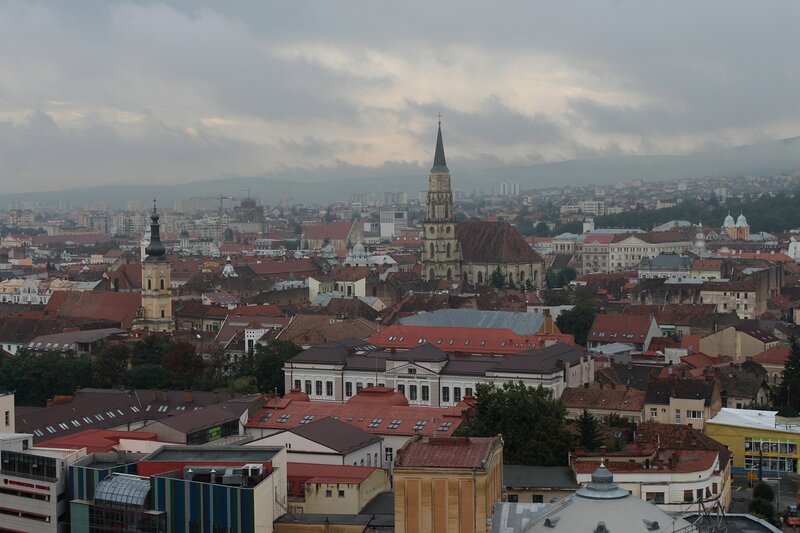 It looks like an interesting city with plenty of beautiful buildings, though perhaps better seen on a less gloomy day! After negotiating the many pavement works in the centre of town (often helpfully arranged on both sides of the road at the same time to thwart the pedestrian) I made it back to my hotel, checked out and headed back to the airport to meet up with the tour group I am spending the next week with. I held out some hope for the week ahead after the skies unexpectedly cleared and the sun began to shine in defiance of the forecasters. The drive northwards gave us our first sight of the deathly pallor of local industry, from derelict factories to abandoned power stations, before we made our way into the hills. 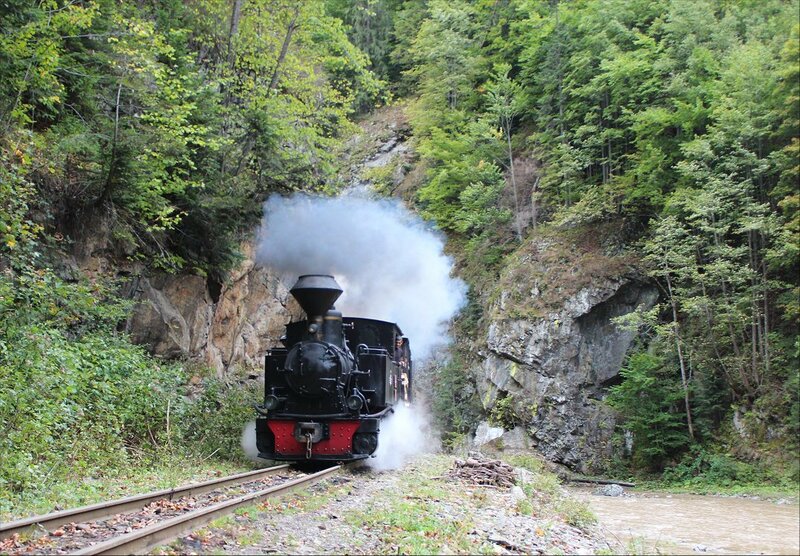 A fair stretch of the road followed a rather beautiful standard gauge line with some quite spectacular viaducts which must have been a sight in steam days. The route also took us through many hillside villages, with horse drawn carts becoming an increasingly common sight on the road as we got closer to our destination. 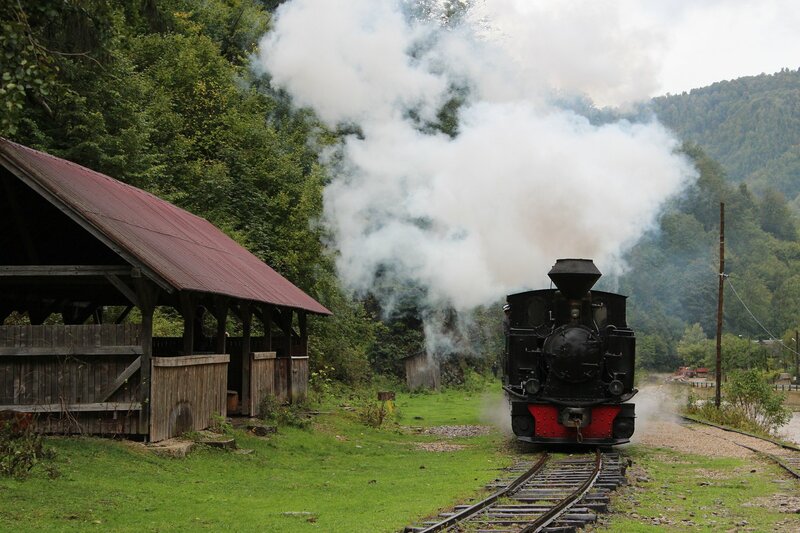 We arrived at Vișeu de Sus at 5.45pm, well ahead of schedule, partly because our driver was speeding through the villages with little regard for what he could see ahead of him – living dangerously on our behalf! Although the town had something of a timeless look, we were assured that change had well and truly arrived here. The asphalt road through town was still a dirt track only a few years ago and a tourist village is under construction near the railway station. The town probably looks quite delightful on a summer’s day, but perhaps not quite so appealing on a damp day such as this. The clouds hung low over the hillsides, threatening rain, as we headed off to our pensions. After settling into our pensions (in my case the rather charming Pensiunea Barsan, complete with a terrace overlooking the railway line) we headed back to a stationary dining car of the Carpatia Express for a four course meal that was served up over three hours. The lure of a night shoot with the locos proved too tempting for most, so only a handful of us were left to sample dessert as the clock struck ten. Getting back to the pension proved interesting – the road was paved and lit partway, before giving way to an unpaved and unlit track. A torch was essential if we were to avoid succumbing to the gigantic puddles that had formed whilst we were eating. It was a relief to make it back to the comfort of my room without having an unexpected swim!